Twenty3:Fifty9 is a progressive metal outfit based in Dallas, Texas. The name is a little hard to remember until you think of it as “one minute to midnight” (an allusion to the fact that guitarist Jeff Beardsley tends to wait until the last minute to do things). 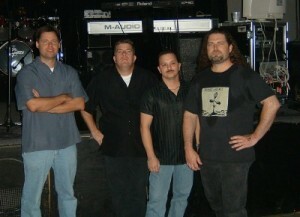 Beardsley and keyboardist Brian Bradford were members of a Dallas-area “party band” called D’Nile. Inspired by a trip to ProgPower IV they and D’Nile drummer Bill Rankin decided that the Dallas area could use their own prog-metal band influenced by such bands as Dream Theater, Fates Warning, Symphony-X, Savatage and Evergrey. After recruiting bassist Tom Martino, they have been working on a rock opera of The Count of Monte Cristo. They are partway through recording sessions for their first CD entitled Act One. This will be followed up by a second CD, which, of course, is to be called Act Two. I saw these guys (and gal … more on that in a moment) playing their second live concert in Dallas’ Deep Ellum club area downtown in a place called The Galaxy Club on Friday, November 11th, 2005. I had heard the recordings on their web site of their work in progress on the album and was pretty impressed. Though the acoustics of The Galaxy Club left something to be desired, they did a great and powerful show. I later discovered that getting out away from my table, where I was drinking a beer, and moving out onto the dance floor (just to listen, not to dance) dramatically improved the sound quality. Yes, I can certainly hear the Dream Theater influence, but also a bit of Kansas-style accessible-but-not-sold-out prog. I was surprised to see a woman join them onstage to sing for several numbers. She turns out to be Kristine Rios, their former lead singer from D’Nile (yes, they did call her “The Queen of D’Nile“, wouldn’t you? ), who sings the role of Mercedes in the rock opera, both on stage and in the recordings. They have recently included another local club band singer, Barbara Jean to sing one of the roles in the opera, and have just finished recording her first number for the album. This entry was posted on Wednesday, March 8th, 2006 at 5:46 pm	and is filed under Live Reviews. You can follow any responses to this entry through the RSS 2.0 feed. Both comments and pings are currently closed.